Ninjas, Nuts and Keflings, Oh, My! OK, so it’s not quite alliterative, or a proper tribute to Dorothy’s line, but it’ll do. Just a few things of interest to note today. One, some of my NinjaBee coworkers are out at PAX today, revealing our latest game, Nutjitsu! I don’t have a lot to show for it just yet, but when we do the non-PAX announcement, I’ll be sure to point to it as well. I didn’t get to work on this one, but it’s looking pretty good. Two, one that I did work on, A World of Keflings, is now available for Windows 8, and we’ll have it out for the WiiU later this year! It’s a little different, controlling the game via the touch screen of a tablet computer, but it’s still the great core game that I’ve had the privilege of working on for a few years now. Three, there’s this gem from The Rampant Coyote (who worked at Wahoo before my time here, so hey, there’s the common thread), addressing the recent interview with Richard Garriott that has some game devs a bit… irked. For good reason, as it happens. He makes some good points, but man… the guy has an amazing ego. Anywho, I had hoped to have my steampunk/gearpunk poker deck done by now, but tech issues and scheduling conflicts mean I still have 6 face cards to do. It’s getting there, though, and it’s fun to see it come together. 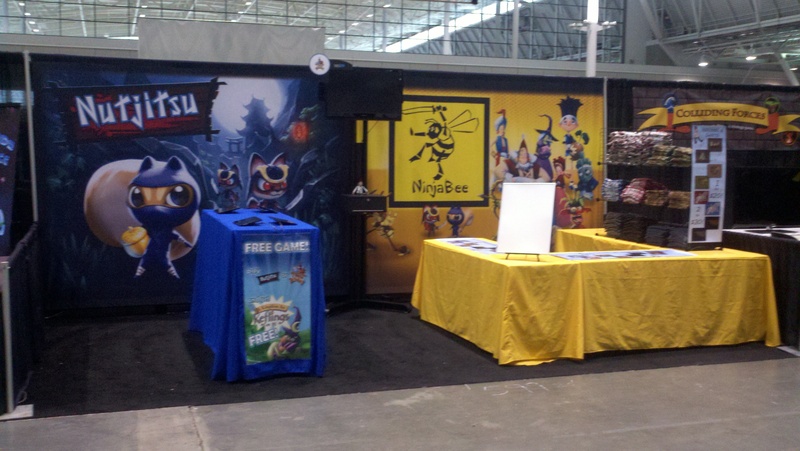 This is what the NinjaBee booth looks like out on the PAX floor. Stop by if you’re in the neighborhood! Not all at the same time, though. NinjaBee’s game A World of Keflings (a game I worked on quite a bit) is on sale this week over at XBox.com, and just in time for our latest DLC to hit the shop. OK, technically it’s a little early, but it’s on sale this week, and the Sugar, Spice and Not So Nice DLC releases tomorrow. 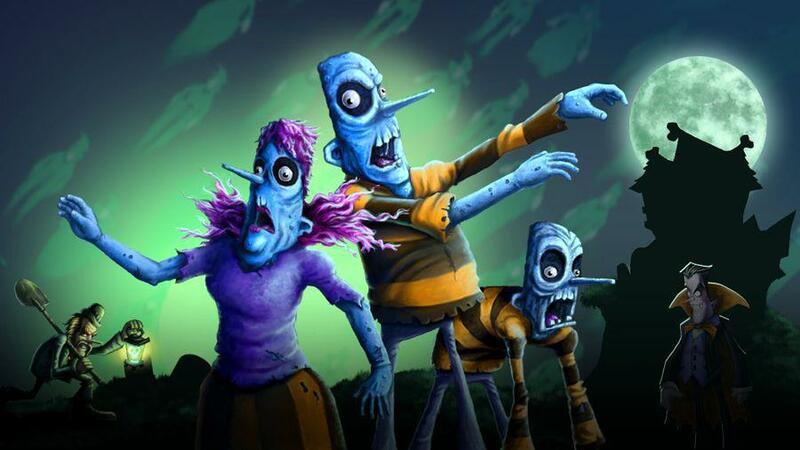 As teased in that trailer for the DLC, we’re also releasing a second DLC, Curse of the Zombiesaurus, giving us a nice double serving of October-flavored gaming goodies. I worked a LOT on both of these DLC releases, and it’s been fun to see them come together. I’ll be writing about the art and design of these things when I can get something put together. If nothing else, I want to put together an article in praise of noobs. …yes, it’s relevant. Mostly. This one’s just a public service announcement. My employer, NinjaBee, now has a trailer up for our latest A World of Keflings DLC, Sugar, Spice and Not so Nice. I worked a ton on this, and it’s really good to see it getting some attention. When the game releases, I’ll try to post a bit more on it and maybe talk shop about what I actually do at work, if you all are interested. A look behind the curtain, as it were. I had no idea this was in the works. Sneaky ninjas. The Indie Royale guys have a new bundle up of NinjaBee games, four with a fifth if you beat the minimum price. I’ve worked on four of these, though, admittedly, only on a phone port for Outpost Kaloki, not the original game. Cloning Clyde was done before I joined the Wahoo/NinjaBee team, as was the original Outpost Kaloki. So yeah, go check it out, y’all! It’s hard to beat the price on these. Am I shilling for my company? Yes, yes I am. They are good games, too, and ones I’d recommend as great indie titles anyway. I have a soft spot for Band of Bugs especially, tactical game nerd that I am. Oh, and speaking of ninjas and hidden secret things, I’ll come back to that “hidden” photo from last post. There’s an art point I want to make with it, but I’ll let it sit for the weekend. The first PS3 game I’ve ever worked on, finally released! Of course, I don’t actually have a PS3… but still, it’s a sweet game. It’s sort of like… A Kingdom for Keflings crossed with StarCraft‘s Zerg creep… except you’re trying to use the sorta-creep to save a village. And the hero has Jell-O hair. And the mentor is a raccoon. …yeah, we’re kinda weird. We like it that way. I’m not stalling for time while I put together another Balance article. Nope, not at all. This is something I’ve been itching to share but only recently got permission to do so. I’m an artist in the game industry. I work with other artists who also happen to be in the game industry, which is convenient, since we’re working on the same projects at the same company. Here at NinjaBee, the little studio that I work for, the artists have started monthly art challenges. These keep our skills up and are just plain fun. Beside that, most of these other artists are better than I am, so if you like my scribblings and paintings I offer on occasion, you might just like seeing what other artists come up with. But please, don’t mess up the place. It’s a nice, quiet, classy blog where some game artists post weird, wacky art. I’m sharing because it’s great art by some great people, and I figure a few of you might appreciate that sort of thing. It might even spur some of you to try some of our challenges, which can be great exercises for anyone interested in working in this industry. …and some of the pieces of those costumes are found here. It’s a curious thing, this new MS policy, allowing devs to have a bit more to offer in the avatar customization arena. Not only is it a way to maybe monetize interest a little more, but it’s also advertising of a sort, not unlike branded t-shirts. It’s also fun; I can’t wait to see someone meandering around in a NinjaBee costume. I think it’s a good thing, and I’m very curious to see where things go. I spent a fair bit of time painting this costume over a generic avatar, offering this as a proof of concept for what we might offer for avatar costuming. The final male Arabian costume doesn’t quite match up with my original concept, but it’s fun to see that it’s at least similar to what I dreamed up. It’s especially fun that they kept the little trim decoration design. I doodle that sort of thing all the time in my notebooks and sketchbooks, and it’s fun to see it get through the production pipeline. Might I chime in as a game artist with a background in film production? I’ve worked with some fine concept artists, but inevitably, given engine or time constraints, the final implementation of concept art will not match the concept perfectly. Some companies do try to match it as tightly as possible, and others use concept art as mood pieces to set the emotional tone for a piece of the game. Still others are mere color studies, a great many others are merely experiments, and it’s even likely that the bulk of concept art is merely sketch work. It’s impractical to polish it all up to “museum” quality. I’d go so far as to say that we’re not likely to be seeing even 5% of the concept art created for the project, and what we do see is likely a cross section of varied types. Straight up production pipeline concept art almost never makes it out of the studio. Even if it did, probably only 10% of that art is faithfully represented in the game down the most granular details. There are simply too many compromises to be made in the translation from fine art to game art, most especially in the change from 2D to 3D. If the final game art can match the mood and spirit of the concept art, evoking the emotional response that the devs desire, even if some details are lost along the way, the production is successful. Think of concept art as a sketch (as so many of them are for various reasons; trying to make the equivalent of the Mona Lisa in 3D would be ridiculous in game production schedules) that must be translated into something playable. Much as the translation from vision (or reality) to painting can lose fidelity, translation from concept to final can lose fidelity. The best production pipelines don’t sweat that loss. They find the most important parts of the art and focus on those and let the unnecessary bits go. That’s where the artistry and skill comes in on the production floor, making the choices on where to spend time. That’s where the art director steps in and keeps both the concept artists from going too far and the production artists from endlessly chasing miniscule details. It’s a matter of scope… and a LOT of game devs don’t do that well, to be blunt. That’s an article in itself, though. So, concept doesn’t always translate directly to the final product, for a number of reasons. I also intend to dig into this a bit more with Yet Another Artisty Article over at the official NinjaBee blog… but I’m not done with that article yet, and it might need to fit into the promotion schedule. I’ll mention it when it comes up. There’s only so much detail I can get into for a variety of reasons, but I really want to show a bit more about how things go from concept art to final game asset.